The Board of Supervisor’s meeting was called to order at 7:04 p.m.
Officials present: Chairman Dan Knutzen, Supervisor 2 Tom Neubert, Treasurer Jeri Ohman, and Clerk Karen Herman. Supervisor 1 Dan Rettler was absent. The Treasurer left the meeting once her agenda items were discussed. The agenda was posted according to the open meeting law on July 7, 2016. MOTION: Neubert/Knutzen to dispense the reading and accept the 6/13/2016 monthly Town Board Meeting minutes as presented. All said aye. Motion carried. a.) Sheriff Department– No one present. MOTION: Knutzen/Neubert Parcel #010-004002 be given a building permit if applied for. All said aye. MOTION: Neubert/Knutzen to approve the Beyer split. All said aye. Motion carried. 5.6AC parcel with home. The remaining 29.873 AC will remain in Exclusive Agriculture. remains exclusive agriculture. All said aye. Motion carried. the Previous Month – Treasurer’s report was reviewed. The sum of $43,767.00 from the Money Market FCCU New Fire Truck Loan transferred to the budgeted category Equipment Fire Truckto pay the bills. The sum of $300.00from the FCCU Money Market Accountbetransferred to the Park and Recreation Savingsaccount because the “New Home – Park and Recreation Fee” was paid for by Resident K. Vandehei. Total in the Park in Recration Savings account $11,551.17. chassis final payment. All said aye. Motion carried. MOTION: Knutzen/Neubert to pay the building inspector. All said aye. Motion carried. Discussed the incorrectly charged building permits and moving forward. h.) August 9, 2016 Partisan Primary/Election Workers/Machines/Training–Training discussed. i.) Town Hall –RJM Construction Pavilion Plans/Storage Shed –Tabled until the next Town Board meeting. Ballard/Culbertson Rd Culvert – Install New Culvert – Tabled until the next Town Board meeting. Crack Sealing Proposal – Tabled until the next town board meeting. Scott Construction – Chip Sealing Kropp Rd – Tabled until the next Town Board meeting. bridges. Tabled until the next Town Board meeting. MOTION: Knutzen/Neubert to adopt the resolution Just Fix It campaign. All said aye. Motion carried. Review Hortonville Resolution Regarding Rail Road Right of Way– Reviewed. Discard paperwork. k.) Planning Commission – Creation of Base Farm Tract Map – Tabled until the next Board meeting. Official Zoning Map needed according to approved Ordinance #01-2015 – Not discussed. Plan – The Planning Commission recommended that the Town Board approve the Comprehensive Plan. MOTION: Neubert/Knutzen to adopt the revised Comprehensive Plan. All said aye. Motion carried. and Lemke to ask if they would like to continue with the Planning Commission for another 3-year term. needed because an inspection is needed. Normal fee will be charged $250 for a shed with electric. Chelsey Keller $797.50 – Nothing new to report. letters for the $200.00 ambulance run collections. (3) $606.00, $436.00, $556.00 – Attorney will be sending letters for the $200.00 ambulance run collections. of Loan– Final payment for truck chassis to Truck Country $43,767.00 approved tonight. Request for final loan draw $241,769.00 for fire truck loan completed. the agreement and forwarded a copy to Ryan Schomisch, Black Creek Fire. Take off agenda. WTA that an ordinance needs to be written to rescind the disposal and pond ordinances. $24.90 per cost of grave upkeep total $522.90. All said aye. Motion carried. Document was signed. 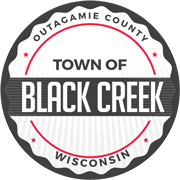 Clerk will forward the document to the Outagamie County Clerk. List of July bills are attached. MOTION: Neubert/Knutzen to adjourn at 9:00 p.m. All said aye. Motion carried.